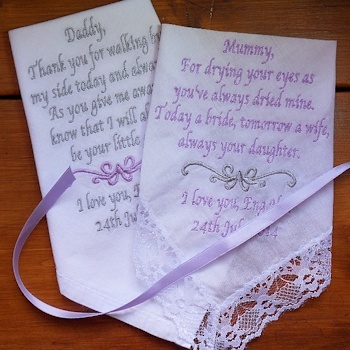 Mother and Father wedding handkerchiefs with poem messages and swirl scroll motif embroidery. Pair of personalised handkerchiefs embroidered with up to 40 words for a long message, phrases or poem. A special keepsake gift for weddings, anniversaries or birthdays. The text will be custom embroidered in thread colours of your choice onto a ladies lace trim cotton handkerchief and a mens cotton hemstitched handkerchief. After you have added this item to your basket and completed checkout - Please Email us your poems or messages for each handkerchief. In your email please tell us the thread colours you would like for the text and for the scroll motif . Up to a maximum of 40 words on each handkerchief. Optional presentation: Each hanky will come in it's own organza gift bag. Or you can choose for each to come in a black gift box. Or with personalised printed ribbons tied around each gift box. If you select this option please include in your email what you would like each ribbon to say.